Traditional models of concurrency resort to peculiarly indirect means to express interaction and study its properties. 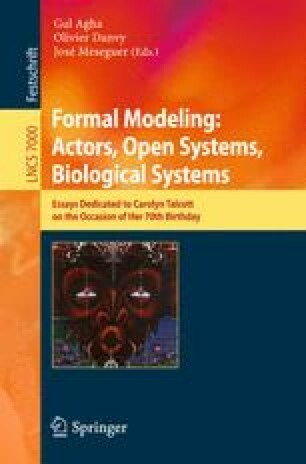 Formalisms such as process algebras/calculi, concurrent objects, actors, agents, shared memory, message passing, etc., all are primarily action-based models that provide constructs for the direct specification of things that interact, rather than a direct specification of interaction (protocols). Consequently, interaction in these formalisms becomes a derived or secondary concept whose properties can be studied only indirectly, as the side-effects of the (intended or coincidental) couplings or clashes of the actions whose compositions comprise a model. Treating interaction as an explicit first-class concept, complete with its own composition operators, allows to specify more complex interaction protocols by combining simpler, and eventually primitive, protocols. Reo [20,11,12,6] serves as a premier example of such an interaction-based model of concurrency. In this paper, we describe Reo and its support tools. We show how exogenous coordination in Reo reflects an interaction-centric model of concurrency where an interaction (protocol) consists of nothing but a relational constraint on communication actions. In this setting, interaction protocols become explicit, concrete, tangible (software) constructs that can be specified, verified, composed, and reused, independently of the actors that they may engage in disparate applications.